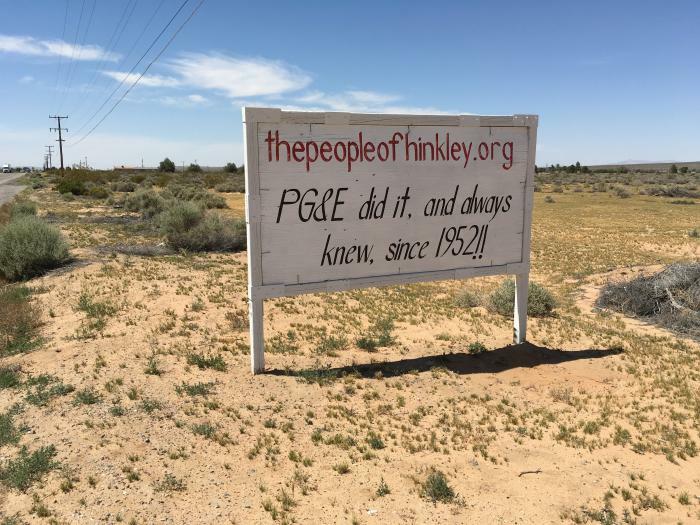 Residents of the town of Hinkley, California, alleged that PG&E knowingly dumped wastewater contaminated with chromium-6, a known carcinogen since 1925, into the region’s groundwater. In 1952, the Pacific Gas and Electric Company (PG&E) installed a compressor station near the town of Hinkley in San Bernardino County, CA part of a gas pipeline system linking Texas to California. Since then, the company has used a carcinogenic chemical compound named chromium-6 as a corrosion inhibitor in its cooling system. 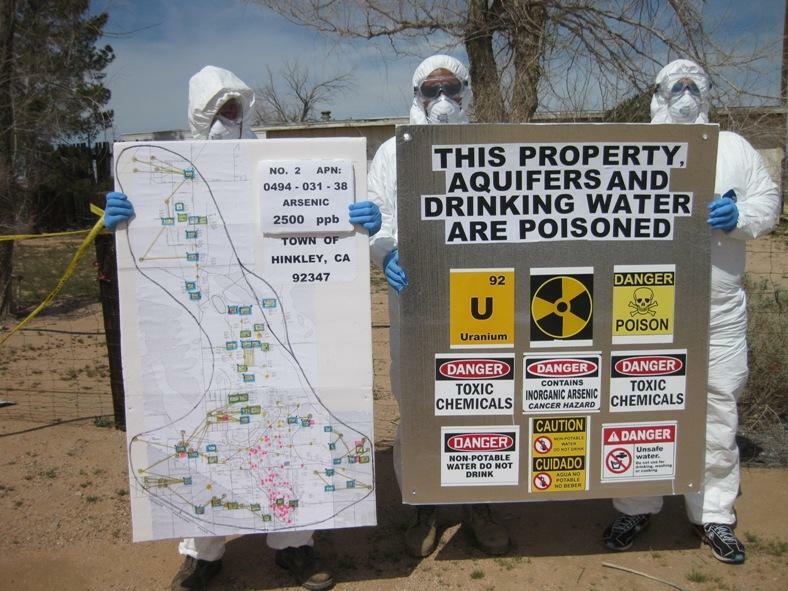 The contaminated water was discharged into unlined pools, thus leaking to the aquifer serving Hinkley’s residents water needs. The leakage occurred (at least) from 1952 to 1972, the year PG&E lined the discharging pools. However, it was not until 1977 that the California state passed a Law regulating the use of chromium-6 and limiting its concentration in water to 50 µg/L. Chromium-6 is known for causing damage to several organs and different types of cancer. 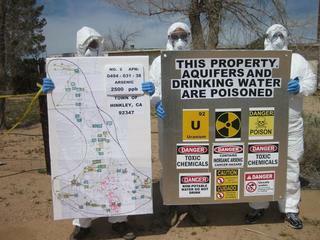 Moreover, the compound also modifies human DNA, which can prolong the effects of exposure to future generations. Local residents experienced several symptoms associated with chromium-6 contamination including prostate, cervical, breast and stomach cancers and respiratory problems. In 1987, PG&E officials informed the state of California of high levels on chromium-6 in underground water north of the discharge ponds. The levels were 10 times greater than the limits established by CA’s 1977 regulation. At that time, PG&E started buying properties affected by pollution. Yet, company officials told citizens the water was suitable for both drinking and agriculture. Erin Brockovich, a clerk at ‘Masry and Vititoe’ Law firm, came across records on PG&E’s offers to buy Hinkley’s citizens properties while filing them. The fact that these documents were mixed with residents medical records raised Brockovich’s attention. The clerk decided to investigate the case and ended up convincing some of the people affected by contamination (and the lawyers she was working to) to start legal action against PG&E in 1993. Initially, there were 77 plaintiffs but the numbers raised to 648. While PG&E lawyers tried to de-link people’s health problems from exposure to chromium-6, the plaintiffs showed that the company knew the contamination at least since 1965 and did nothing. PG&E eventually managed to take the case out of courts and reach a settlement through mediation. In 1996, PG&E agreed to pay the plaintiffs a total of 333 million dollars, to end the use of chromium-6 in its cooling system and to clean up the environment. After several unsuccessful attempts (the contaminated plume kept growing) to clean up the contaminated aquifer, PG&E started buying people’s houses in 2012 and destroying them to avoid squatting. Two-thirds of the residents in the affected area agreed and moved elsewhere causing Hinkley’s population to fall considerably. 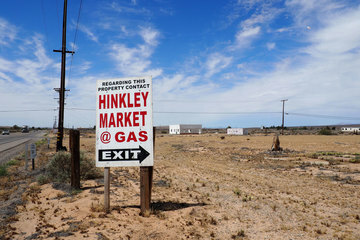 Later studies by the California Cancer Registry stated that cancer figures in Hinkley weren’t abnormal in the period 1988-2006. However, the Center for Public Integrity questioned the validity of the findings due to methodology problems, exclusion of the most serious cases and lack of independence between researchers and the chemical industry lobby. -Hexavalent chromium was an additive that prevented rust in the gas cooling towers, and it was disposed of in nearby pools. Under ideal circumstances, the dangerous heavy metals would be filtered out and reclaimed. Relevant government actors Agency for Toxic Substances and Disease Registry (ATSDR); California Environmental Protection Agency (Cal/EPA); California Department of Public Health; National Toxicology Program (NTP); California Cancer Registry. Development of Alternatives Specific demands: Decontamination and monetary compensation to affected people. Why? Explain briefly. The case settlement ended up in monetary compensation for the plaintiffs, but several people died before 1996 and many victims weren't included in the settlement. PG&E was unable to contain the plume of polluted water, forcing an exodus from the exposed areas. The area will be inhabitable until someone finally solves the problem. PG&E had to clean up the contaminated groundwater and stop using chromium-6. By 2013 PG&E had spent over $750 million on remediation. However, the town remained polluted and Hinkley is a ghost town now. Other Comments This particular case became very famous in 2000 when the movie "Erin Brockovich" with Julia Roberts was released.